Everything about my stay at the property was great. Convinient and friendly, accomodations were clean and confortable..and they had everything I need it in the appointment. The place is in a great location with the best access to public transportation; also the service at the check in desk is really great, people always helpful and great attitude. The facilities are perfect. These guys got a really good thing going. We booked here as its close to Camp Nou and we were going to a game. 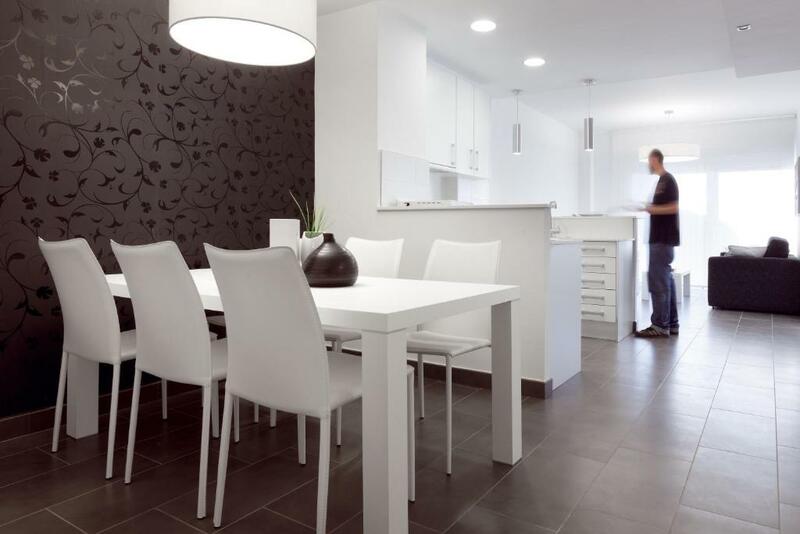 The apartments are super modern and clean. Ours looked very new and was a decent size for 2 ppl. The front desk guys are really helpful and friendly. There are some great restuarants nearby all recommended by the staff. Its a 10 - 15 minute walk from Camp Nou depending on your access point. Theres a metro stop outside the door so its easy to get around to the other areas of the city. All in all good value for money. Clean, convenient, nice area, secure, 24 hour staff, kitchen in room, very near to markets and cafes, laundry, very convenient to subway, & safe in room for valuables. We didn't know the area, so to find it was so close to the metro was a bonus. We had come to see a Barca game at the Nou Camp, so it was great to find the stadium was just down the road. 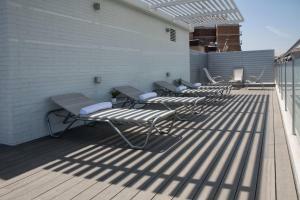 Lock in a great price for 08028 Apartments – rated 8.8 by recent guests! 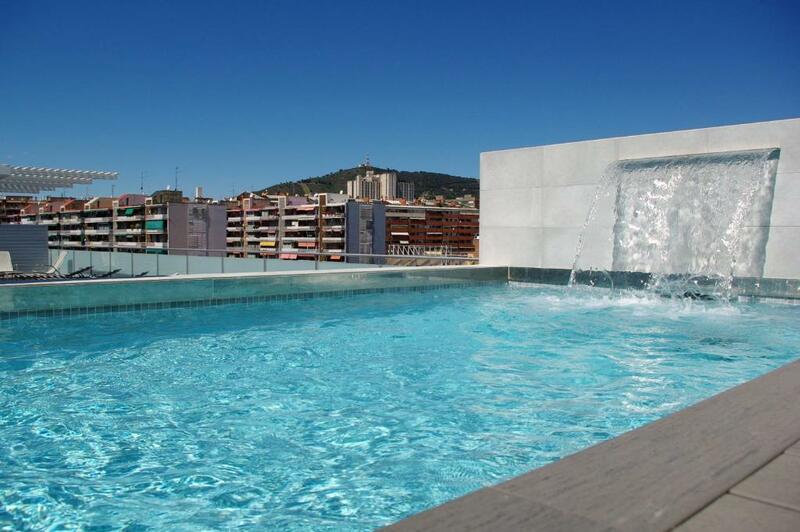 One of our top picks in Barcelona.08028 Apartments are situated next to Les Corts Metro Station and a 5-minute walk from Barcelona’s Camp Nou Football Stadium. The modern apartments share a rooftop pool with views of Barcelona. 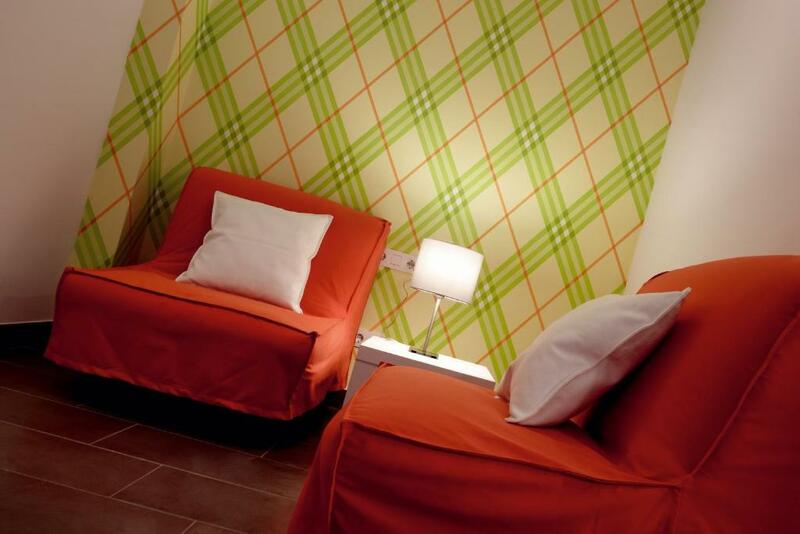 The apartments and suites at the 08028 feature contemporary design and free Wi-Fi. Apartments include a balcony, lounge area and a fitted kitchen. 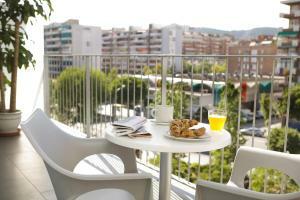 The 08028 Apartments are a 15-minute walk from Sants Train Station. Plaza Catalunya and the famous Las Ramblas can be reached in around 20 minutes by Metro. 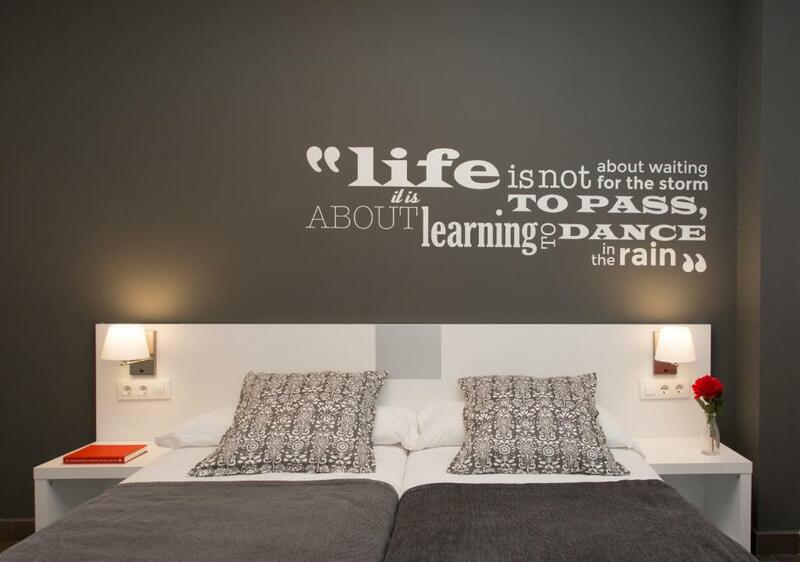 When would you like to stay at 08028 Apartments? This duplex apartment comes with a fully-equipped kitchen opening onto a large living-dining area, and an en-suite twin bedroom in the ground floor. In the upper level, there are 2 double bedrooms and a bathroom with a shower. Bed linen, towels and cleaning products are provided. The building has a self-service laundry and drying room. This room comes with 2 single beds and a private bathroom. Room service is available in this room. Cleaning takes place daily. This room type does not have a kitchen. This apartment is composed of a twin bedroom and a bathroom with a shower. The open-plan kitchen includes a microwave; bed linen, towels and cleaning products are provided. This apartment is composed of 2 twin bedrooms and a bathroom with a shower. The open-plan kitchen includes a microwave; bed linen, towels and cleaning products are provided. This studio is composed of 1 bedroom with 2 single beds joined together and a bathroom with a shower. The open-plan kitchen includes a microwave; bed linen, towels and cleaning products are provided. This duplex apartment features a large private terrace. The apartment is cleaned only for stays of more than 6 nights. Cleaning materials are included in the apartment. The building has a self-service laundry and drying room. Located on the ground floor, this apartment comes with an open-plan kitchen looking onto a living-dining room equipped with a dining table, a sofa and a flat-screen TV. On the upper level, there is a spacious bedroom with 2 single beds joined together, an en-suite twin bedroom, and a dressing room. Another bathroom is available on the ground floor. Offering a balcony with city views, this apartment comes with an open-plan kitchen completed with a microwave and kitchenware. Bed linen, towels and cleaning products are provided. Our apartments in Barcelona are concentrated in an aparthotel equipped with all services, bar, restaurant, cafeteria, parking, pool and solarium, luggage service, laundry, Wi-Fi, check-in and reception 24 h.
I am Ricardo Campo, general manager 08028 apartments.I am an appasionate of Barcelona and tourism world. 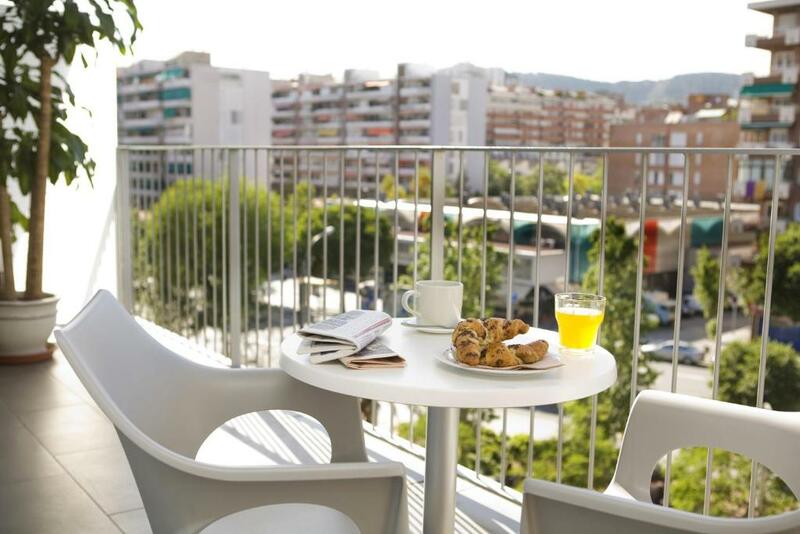 08028 apartments is located in the district of Les Corts in Barcelona, one of the best residential neighborhoods of this wonderful city. Our apartment is located just meters from the Camp Nou, in an area with all amenities; markets, grocery stores, restaurants and shopping centers. At the door of our hotel you can find Les Corts Metro Station, which gives you access by public transportation throughout the city. Area Info – This neighborhood is a great choice for travelers interested in city walks, city trips and monuments – Check location Excellent location – show map Guests loved walking around the neighborhood! House Rules 08028 Apartments takes special requests – add in the next step! 08028 Apartments accepts these cards and reserves the right to temporarily hold an amount prior to arrival. Please note that only the number of guests indicated at booking can enter the accommodations. Please note that guests with a nonrefundable booking must present the credit card used to make the reservation on arrival. If you are not the owner of the credit card used to make the reservation, please contact the property in advance. Unfortunately the Taxi driver you booked for me robbed me blind. The taxi fare to the airport even after he drove around the block twice was only 25 Euros. He then pushed that up to 48 when we got out of the car. Daylight robbery and a thief that made me want to hit him. Hotel transfers would help. Great location, nice staff! 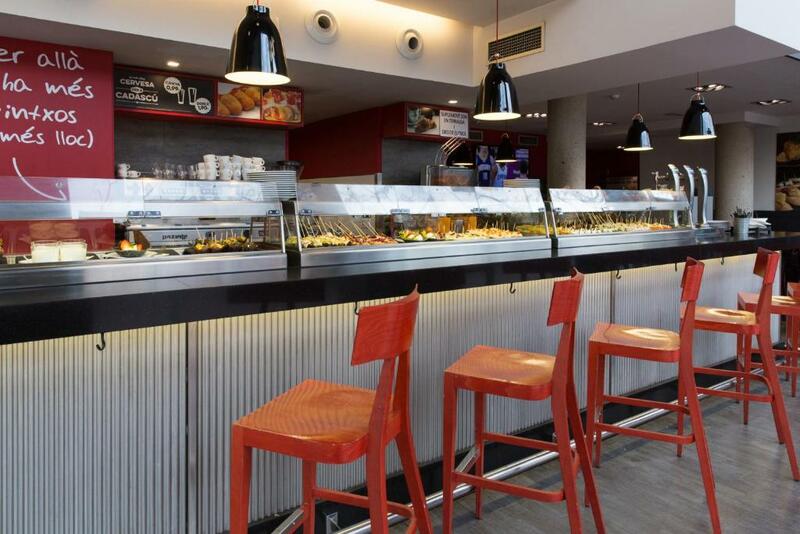 Clean, nice area, secure, very near to markets and cafes, very convenient to subway, nice tapas bar downstairs. 10 minutes to Camp Nou, 2 minutes to subway, 25 minutes of nice walk to Plaza d' Espanya. 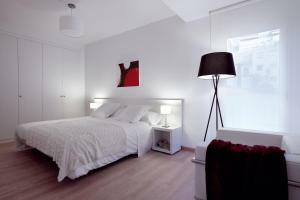 1 min walking to the metro station, many tapas bars there, great place to stay, spacious and clean! Was great we got an 'upgrade' but for some reason was given a twin room so not to sure if it was much of an upgrade. Also walls were paper thin and was slot of noise from other guests. The kitchen appliances were a little bit outdated. Reception guy is brilliant. Opposite bakers is lovely. Some other guests on our floor were noisy late at night. Very helpful staff. All restaurant recommendations were perfect for what we wanted.